Workshop topics have included paper-making and testing, watershed models, wind turbines, heart beat regulation, Science for Health and Life, coding, Scratch software, fermentation, environmental engineering, environmental health, ornithology, and more. Secure a seat, and ensure we plan for dietary, mobility and other constraints. In 2015, in response to long-standing requests to the Women’s Caucus to extend the age range for Kids Day, and Girls Inc’s Youth Development team’s desire to find a permanent home for their established (but nomadic) program, the two groups partnered with ESF’s first Interim Chief Diversity Officer to plan and host a career exploration program for middle and high school girls right here on campus. 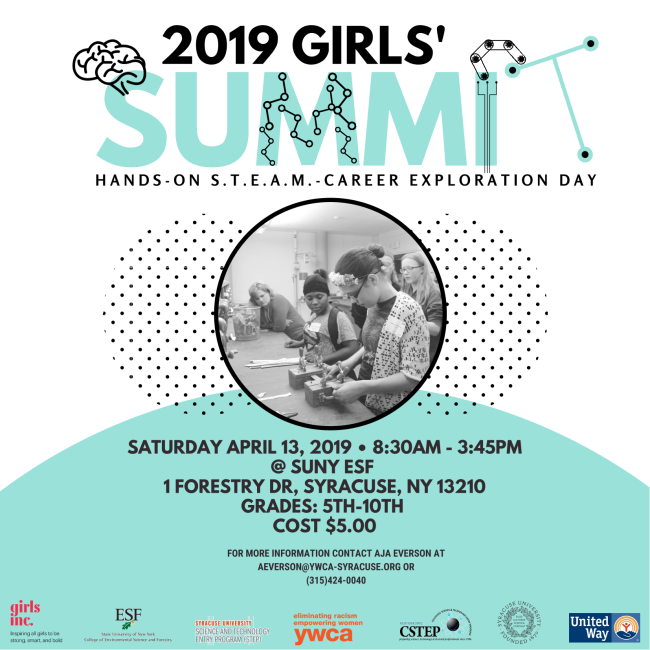 In 2016, we were joined by staff in Outreach (now the Office of Experiential Learning and Outreach), C-STEP, and SU’s STEP program, and >90 girls participated in workshops and panels on both campuses! In fall 2017, Dimensions Mentoring program and our first official CDO joined the team to plan the 10th annual program in 2018, in which more than 100 girls participated! Workshop leaders develop 45-minute hands on experiences to introduce some aspect of their fields. Group guides facilitate discussions, administer pre- and post-surveys and ice breakers, and get groups to where they need to be. Help is also needed during registration, data compilation for reporting requirements, and during lunch. Volunteers must register in advance in order to be screened per SUNY Child Protection Policy.